Maybe I was in a rush to post the Day 2 summary, I’m not sure. I forgot to summarize the final presentation of the day. Pronation isn’t a bad thing–it’s supposed to happen. Pain at the metatarsal phalangeal joint as the heel leaves the ground too early. I have off and on metatarsalgia. I’m going to work the toe flexors, particularly the flexor hallucis brevis. I’ll use a band. Dancers and defensive backs get this as a result of doing a lot of stuff on their toes. Loaded dorsiflexion of the big toe should be 42 degrees at toe off. To check: Sit with knees bent at 90 degrees. Lift toe with finger while foot is flat on the ground. If it’s less than 30 degrees then you’ve got a problem. Stretch toe flexors: Pull toe back 20-30x/day. Restore joint motion to big toe. I’ve been playing with this stuff quite a bit lately. I’ve got a constantly tight left calf. I’m wondering if restricted toe dorsiflexion is part of the problem. I’m not only working to stretch the FHB, but also to strengthen it so my big toe can grip the ground. Seems I have a bit of this; more along the lines of a bursitis from what I cant tell. He says “Work on the front of the tendon,” as that’s where the blood flow comes from. He describes this as occurring with an audible squeak or creak–I’ve had that! Work on the front of the tendon to increase blood flow. Check out my post on IT Band issues for more help. The popliteous unlocks the knee from the extended position. Internal or external femoral rotation may become problematic. A TFL problem = a glute medius problem. This is huuuuge to me! Seems to me that sitting too much is maybe the main problem here. I’ve had some on and off right shoulder pain for a while. Along with it has been some wrist and elbow pain. I’ve worked wrist mobility, elbow mobility and I’ve worked shoulder internal rotation as well as elevation and retraction of the scapula. Like I said, the pain comes and goes so I figure I’ve been knocking on the door of the issue, but I haven’t yet nailed it. I’ve employed the following process to very good effect. I’ve used the same process with several clients and seen some very nice changes in shoulder pain and mobility, and neck pain and mobility. Recently, I asked my wife to look at my shoulders from the back and see if there were any discrepancies or anything that seemed out of place. She quickly said my right shoulder was higher than my left. I took a wild guess and figured I had an elevated scapula and that perhaps my lower fibers of my trapezius muscle weren’t doing their job. can see the superior fibers originate from the base of the skull and attaches at the lateral clavicle, acromion process, and the spine of the scapula. 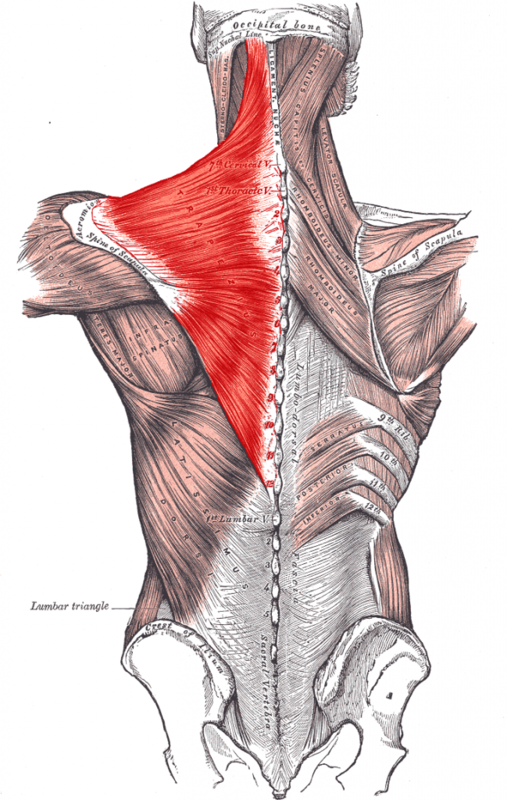 The middle fibers originate from C7 and T1-3 and attach at the acromion and scapular spine. The inferior fibers originate from T4-T12 and run upwards to attach to the lower scapular spine. The traps do several things. Largely, they shrug your shoulders up (elevation), shrug them back (retraction) or shrug them down (depression). The traps also play a role in rotation, lateral flexion, and extension of the neck. The traps work closely with lots of other muscles including the lats, the levator scapula, deltoids, rhomboids, the muscles of the rotator cuff and a host of neck muscles. Consequently, if some part of the traps are too tight, too long or offline in some way, the result may be shoulder pain, neck pain or other issues down the line such as elbow, wrist or possibly jaw pain. 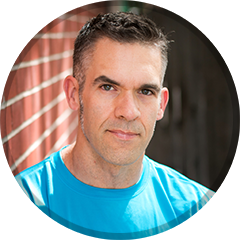 To get things feeling and moving correctly, I like to start with soft tissue work via a lacrosse ball, the Stick, a foam roller, or whatever tool you like to use to soften tight tissue. I’ve found the stick rolled along the upper trap to be quite effective. An example is below. Also, I like to pin a lacrosse ball against my shoulder blade and the wall to get at the external rotators, mid traps, rhomboids, etc. I like to use the lacrosse ball in a similar fashion to work the pecs, but facing the wall instead of backing into the wall. Then, I’ve been using the following combination of stretches and strength work to put things in working order. First are a couple of stretches I stole from Kelly Starrett at MobilityWOD.com. Both are useful ways to work on internal rotation and tie in some neck mobility. We often see poor shoulder movement that includes poor internal rotation and tight neck muscles–whether the lower trap is messed up or not. Working some internal rotation, moving the neck and loosening the tissue in that neighborhood seems to help facilitate good shoulder movement. Second, I use the prone-Y simply to get a feel for what it feels like to use the lower traps. It’s nearly impossible to do this one wrong. Make sure to keep the glutes engaged so the low back doesn’t arch too much. Put a cushion under the forehead so as not to mash your face into the ground, bench, or table. I like to go to mild exertion. This isn’t something to make you grimace. It’s simply to get you connected to your lower traps. The face-pull comes next. Take a staggered stance so as not to lean back. Keep the upper arms parallel to the ground. Keep the shoulders down–but don’t let the elbows drop. This may be a challenging skill for some. You may find your brain gets a tougher workout than any of the muscles involved. Again, no need to go to use a lot of weight or go to high exertion. Technique is #1 here! Then I go to something I call a shrug-down. You can do this with a lat pull-down or cables or tubing of any sort positioned overhead. It can also be done with an assisted pull-up machine or unassisted hanging from a bar. The important thing is not to go too heavy. Just like the other exercises, this should feel too easy to start with. Many people find it quite difficult to shrug the shoulders down without bending the elbows. This is a skill and it may take some time, some steam coming out of your ears, and sticking out your tongue to master it. Finally, I like going to a full cable pull-down or pull-/chin-up. Just like the other exercises, I suggest you go light. Try to separate the scapular depression (the shrug down) from the elbow flexion. See if you can make it sort of a two-part exercise: shrug down, pull up, lower yourself back down, un-shrug. Let me know if this helps your shoulder and/or neck issues. For further discussion and analysis on these findings, have a look at Runblogger’s post (and how these findings are being misused in advertising) and the post at Sweat Science. Both of these guys do a great job of telling us what the data does and does not show. Runners get injured. I’m a runner and I’ve been injured–a lot. If you’re a runner then you either have been, are or are going to be injured. According to one source, 60-65% of all runners are injured during an average year (by definition, an ‘injury’ is a physical problem severe enough to force a reduction in training). If you’ve encountered a running injury then you probably know that it’s rarely a simple solution to fix what ails you. From shoe changes to barefoot running to stretching to foam rolling to foot strengthening exercises, to physical therapy to acupuncture to chiropractic to massage and on and on… This is a huge hassle and it would be wonderful to avoid this kind of aggravation! So with some particle of optimism, I present an article from Science Daily that may help us avoid injury: When to End a Run to Avoid Injury: Runners Change Form When Running Exhausted. The article discusses a study from Indiana University published in the Journal of Biomechanics in November 2010. Researchers observed that subjects demonstrated biomechanical changes as they fatigued during a run. Runners tended to display excessive motion at the hips, knees and ankles. 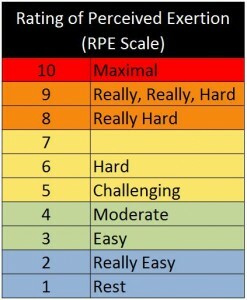 The RPE scale is shown below. What does this mean to you the runner? Don’t run to the point of exhaustion. Stop when you’re feeling good and strong, not when you feel beaten to hunched-over death. Facial expressions can be very useful in gauging our exertion levels. When I’m working with clients I watch their faces. When a grimace starts to show we stop the set. The “scary face” is a transmission from one human to the other humans that something isn’t going all that well. (Next time you’re in the gym, have a look around and see how many people have a look on their face like they’re being stabbed. Don’t be that person.) It means we’re butting up against certain physiological limitations. If we spend enough time doing this we’ll likely end up in some type of pain. Heed your body’s warnings and you can stop injuries before they start. Sometimes I tell my clients, “I make all the dumb mistakes so you don’t have to.” Well, I continue to make less-than-intelligent decisions from time to time when it comes to exercise. I’ve been working out very hard for several weeks and I seem to have overstepped my boundaries. I’ve got some aches and pains that are proving difficult to resolve. Therefore it’s time to dial back my efforts, prioritize rest, and let all my various tissues and functions restore themselves. I want to deadlift 500 lbs. That’s my big goal this year. In order to hit this goal I must put in very hard work. Hard workouts must be balanced by adequate rest–but not total rest. I’ve been lifting three days per week with the idea that I’m doing one heavy workout, followed by a light workout 48 hours later, then a medium workout again 48 hours after that. Then it’s two days off lifting and I start it all over. As important as it is to lift hard on the hard day, it’s equally (maybe even more) important to ease up on the other days, especially the light day. So while I’ve definitely been hitting the hard days, I believe I have fallen short of my goal of lifting light. I must stay far away from anything that feels like exhaustion or muscular failure. I’ll likely add back bench press and/or overhead presses once my wrists and shoulders feel better. Turkish Get-Ups: 1×5 reps each arm–AND THAT’S IT! The key to all this is paying attention to how I test during each workout after every exercise. I’ll be assessing and re-assessing my range of motion frequently (most likely with a standing toe-touch type of assessment), and I’ll be performing Z-Health joint mobility drills often. If I tighten up at all or if I feel any pain then I MUST stop and call it a day. This is of course counter-instinctive to me but I know I’ll feel better if I do. The ultimate goal is 500 lbs. on that deadlift and I won’t get there if I’m beat up. All runners and other fitness enthusiasts–anyone who wears shoes really–must read the latest dispatch from the New York Times Personal Best section titled Close Look at Orthotics Raises a Welter of Doubt. It’s a fascinating discussion on how and why orthotics may or may not work. As the quote above indicates, no one really seems to know what these things actually do for the feet. There are several important points in the article. Dr. Benno Nigg, professor of biomechanics and co-director of the Human Performance Lab at the University of Calgary in Alberta has made a career of researching orthotics. He makes a point that I’ve observed in my own experience with orthotics, namely that they tend to work in the short-term. However he says that idea that they are supposed to correct mechanical-alignment problems does not hold up. Further Dr. Nigg says, “If you do something to a shoe, different people will react differently.” Different feet react differently: One person might respond by increasing the stress on the outside of the foot, another on the inside. Another might not respond at all, unconsciously correcting the orthotic’s correction. Several seemingly well-educated people voiced support for the use of orthotics. Jeffrey P. Wensman, director of clinical and technical services at the Orthotics and Prosthetics Center at the University of Michigan makes a sound argument when he says the key measure of success is his patients feel better in orthotics. Seamus Kennedy, president and co-owner of Hersco Ortho Labs in New York says there are hundreds of papers and studies showing that orthotics can treat common foot ailments. Maybe the lesson is to be skeptical of orthotics makers who show you evidence of the benefits of orthotics. The article goes on to profile someone who has flat feet and his quest to “correct” this issue. Every orthotics provider he went to attributed his injury to his previous poorly made orthotics and goes on to provide him with different orthotics. Dr. Nigg explains that flat feet shouldn’t be any problem. Our arches are an evolutionary leftover of when we used to grip trees with our feet. This is interesting to me because I recall reading elsewhere a study of third-world populations that never wear any sort of supportive shoes. Their feet tend to be flat yet there are far fewer numbers of the type of musculoskeletal injuries we have in the U.S. So maybe these all important arches aren’t all that important? My view on all this is that orthotics are of limited use and the science behind them is quite murky. I’ve used several different types of orthotics and I’ve had either no results or I’ve experienced increased discomfort. I think they are far from an essential component for human health and performance. That said, on an individual basis, an orthotic may be very helpful.